Contract | WHAT A FEELING! 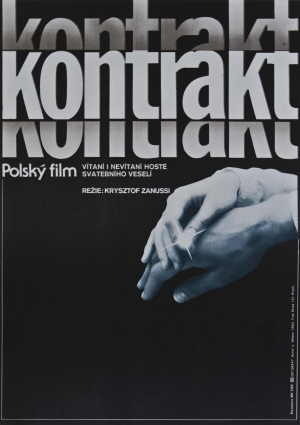 Word has it that the fascinating Polish director Krzysztof Zanussi was so intrigued by Robert Altman’s A Wedding that he decided to try his hand at the same story. A Wedding, film audiences may recall (and not many people do, since the blessed event was barely consummated at the box office), takes the usual Altman cast of eccentrics and turns them loose—that is, throws them together—with rambunctious results. Among the series of social and sexual gaffes that followed, Altman tried to toe the line between comedy and commentary. He’s done that before, with success, but A Wedding went wrong somewhere, in a sour way. Don’t worry—Zanussi’s version is not just Marriage—Polish Style. The format of Contract is the same as A Wedding: mix together a bunch of people who have little in common outside their happenstance connection with the bride and groom, get them in the same house, and let ’em simmer for a while. Sooner or later, the lid will blow off. The hosts are the groom’s father (Tadeusz Lomnicki) and step-mother (Maja Komorowska), a well-to-do couple who own a house nestled in the country. The itinerary is such that a civil ceremony is performed one day, the church ceremony the next, and the big reception immediately following. Well, the bride’s father doesn’t make it to the civil ceremony. The host’s ex-wife icily announces her intention to spend the night in a convent rather than be a guest of the man she despises. Then the groom’s aunt (Leslie Caron) arrives, having smuggled a dog in under her lush fur coat, and loses her wayward daughter at a hotel. These problems are small potatoes. At the church ceremony, the bride is suddenly seized by second thoughts. She excuses herself mid-sacrament and flags down the first car that drives by. As the husband follows, the parents are already smoothing things over. “Everything’s fine,” they insist, as they will keep insisting against all odds and against all evidence throughout the tumultuous reception ahead. Zanussi handles the ensuing adventures with a nimble hand, but the comic format is deceptive. Contract systematically shreds its characters of their trappings of wealth, glamour, and propriety in which they have wrapped themselves. The bizarre hijinks of this crew are all aimed toward that end, and Zanussi—whose Ways of the Night, a more solemn examination of people at ethical loose ends, had a Seattle arthouse run earlier this year—is adept at maintaining the orderly balance of fun and confusion. His chief collaborator is Maja Komorowska, the actress with whom he has worked often. As the hostess, she glides into every awkward situation—and there are many of them—and manipulates things back into a nervous status quo. She’s like the kid who runs back and forth, patching holes in the dike, not realizing the entire structure is about to give way. It’s a splendid performance. The end of the film is deliberately enigmatic; it’s reminiscent of the sea monster at the end of Fellini’s La Dolce Vita. Somehow, this final mysterious visitor gives the characters a challenge, a rebuke, and maybe even a small, ironic blessing. Any film that has that many possibilities in its last moments has done its work well. This movie, made in 1980, was one of the reasons Zanussi was considered an exciting figure at this moment. In a footnote to Seattle theater history, Contract was the first movie that played at the Market Theater in the Pike Place Market, an eccentric and wonderful place to see stuff in the mid-Eighties. This entry was posted on Thursday, August 30th, 2012 at 3:00 am and is filed under 1980, Actually Good 80s Movies. You can follow any responses to this entry through the RSS 2.0 feed. You can leave a response, or trackback from your own site.